… feel out of sync with what’s really important to you? …have a job that pays the bills, but doesn’t have anything to do with what you are truly passionate about? Or maybe you just finished a degree that seemed cool when you started it, but now feels not really related to what you want to contribute to the world. where working is part of fulfilling your personal mission instead of just a way to earn enough to do the things you actually like. A little unsure of how to do that? your dreams and your future. How did I become who I am today? What can I contribute to the world? Aligning you to finally step into the life you really want. In this module, you’ll write your Personal Story. What life events, decisions and people influenced you the most. And what do you want to take away from that into your future? In this module, we focus on Your Uniqueness and the things only YOU can give to the world. Because, let’s be honest, nobody has YOUR exact combination of background, training, experiences, strengths, talents and skills. In this module you’ll make the Journey Within. Challenging as this may seem, the combination of guided meditation and creativity will help connect with your authentic self and acknowledge the power you bring to the world. Using a powerful method developed at Harvard Business School, you’ll connect to the future that is trying to emerge. This will clarify your next steps & empower you to implement them right away, so you can start living the life you dream of. to help men & women like you grow into their full potential. was at the top of my Bucket List for years! taken hours and hours of personal coaching and even did a couple of years of therapy. So. Do YOU need to do all that to get to where you want to be? Of course not! To make your life a lot easier, I combined the knowledge, experience and skills that I acquired over the years into this comprehensive 4 week program. I won’t say it’s not challenging anymore: living your passion & purpose requires practice and stamina. But I know for sure you can do it. And you’re ready. Since I did Rosalie’s course Grow into Yourself, I am much more aware of my thoughts and feelings. I am moving towards acceptance of these and myself in general. I especially liked the meditations a lot! I would recommend Grow into Yourself to anyone who’s unclear about their professional or personal goals. Thank you, Rosalie! I loved doing Grow into Yourself! I understand myself much better now and I feel much more confident about being me. Doing the program helped me take the next steps in my career. I recommend Grow into Yourself to all my friends and colleagues who are uncertain about their next steps. Grow into Yourself is a beautiful way to gain insight in your dreams and goals. It’s action oriented, and focuses on making the right choices. I highly recommend ‘Grow Into Yourself’! The PDF’s are designed to walk you through the modules content and exercises, and help you take action on what you’re learning. The guided meditations complement the content in the PDF’s and help you connect with your intuition. Combining rational thinking with inner wisdom makes the program highly effective. A safe haven for participants of Grow into Yourself, a place to connect and share with other participants. It’s also the place to ask me questions as I am in the group daily. I’ve never done meditation, is that a problem? Not at all! I’ve included a basic ‘how to meditate’ and really, guided meditation is very self-explanatory. How much time will each module take me? Doing every module properly will take about 4 hours a week. How will Grow into Yourself benefit me? You’ll get to know yourself – For Real. You’ll understand WHY you are who you are & why you approach things the way you do. You’ll be more accepting towards yourself, heck, you’ll probably finally be able to appreciate yourself for who you really are. The program has a long, powerful ‘after-burn’, in which you’ll move forward while taking concrete steps towards your dream life & work. What if I don’t live in Amsterdam? No worries! 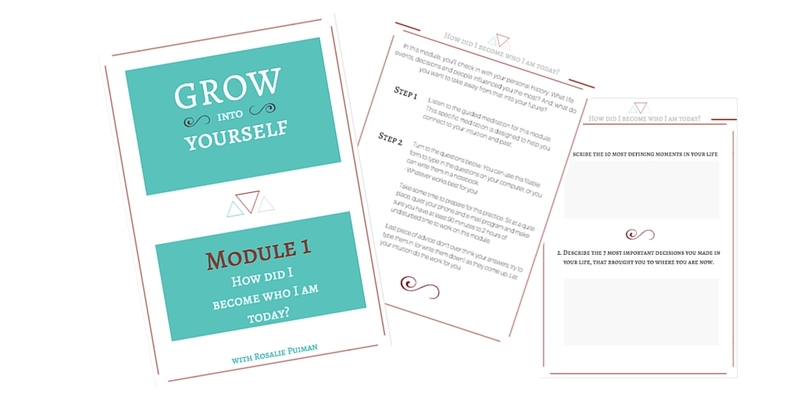 Grow into Yourself is an online program that you can do from your own home in your own time. I’m afraid I’ll uncover all these emotions, and that I won’t be able to deal with them properly. I understand that feeling and to be honest with you, I’m pretty sure things will come up that are emotional to you. The course is designed to take you into the past and back again, into the future. If you follow the program, you won’t be stuck in the past. I recommend to tell one or two people about the program and talk to them about your experiences during the course. Don’t let stuff linger. If it’s emotional, talk to people about it! Can I add coaching later? 1:1 Coaching can be a really valuable add-on and I would love to work with you personally. If you’re interested in that, just let me know via email (rosalie@rosaliepuiman.com) and we’ll make it happen. I believe in this program. I believe ‘Grow into Yourself’ will bring you clarity on who you are and what you can contribute to the world. I believe in it so much, that I offer you a complete money back guarantee if you, after doing the work that’s part of the 4 modules, don’t feel and see the benefit from the program. I do need you to finish the entire program, and do all practices and meditations, before I can give you a refund. I designed the program to be done in full. Without you doing all the work, the results won’t be there. When you apply for a refund, please be prepared to show me notes, creative outlets etc. so I can verify that you did the program in full. When you did, and you feel you haven’t gotten the benefits, I will refund you fully. … to commit to stepping into your full potential? 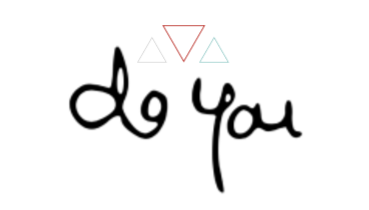 … to foster some awesome personal growth? I know this course is an investment. AND it is an investment in you. decide to commit to something deeper. And start growing into the person you are meant to be. This program is designed to provide information on how to find your true passion and purpose in life. It is sold with the understanding that RSJP Development of Leadership is not engaged in giving psychological, medical or other professional advice to whomever buys this program. Please seek such professional advice, if you need it. Grow into Yourself doesn’t offer professional psychological help. If you decide to make changes in your life due to this program, you will need to invest time and effort to get results. 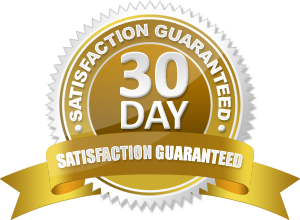 This program does not guarantee success, since your results depend upon your effort and other factors out of our control. Stories shared on this sales page and stories shared throughout this program, are provided as helpful educational examples, and are not necessarily indicative of the expected results of implementing the content contained in this program. Each person featured has unique circumstances which drive their results, such as their experience, implementation, and history. Every effort has been made to make this program as complete and accurate as possible, but there may be mistakes in content or typography. The purpose of this program is to educate and entertain, and RSJP Development of Leadership does not have liability or responsibility to anyone for loss or damage alleged to be caused by the information in this program.